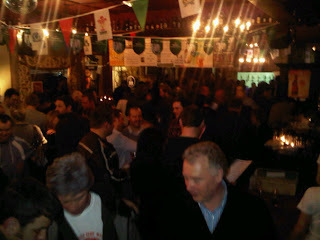 Tuesday, Last, 240 ticketbearing beer enthusiasts showed up at The Bull and Castle, Christchurch, for the launch of Ireland's first Independent Bottled Beer festival. 'Deveney's of Dundrum, The Beer Festival' was even more successful than I'd imagined and although I'd suffered a couple of migranes and serious stress attacks throughout the organisation process. It was 100% worth it!!!!!!!!!!! 110 Bottled beers from all corners of the world including a great range of our own Irish brews, which I'm always keen to see and taste - more importantly!!! Just want to take this opportunity to thank-you all for showing such interest in this blog, my monthly club and subsequently The Beer Festival. Special thanks to my beer importers and also to Henry Chevalier from Aspall's Cyder, Owen from Hilden Brewery and Floris and Guillem from Estrella who all took the trip to Dublin to be here for the big night. Loads of thanks to my gorgeous Beer girls - my lovely sister Clare, Louise, Anna, Karin, Sue, Karen, Kerrie, Lorraine, Christina and Ciara-Ann. I'll be posting up on the full synopsis this weekend. Nothing like the way I would have put them down. The top four are quite bland, though they are good beers. Bitter and Twisted is excellent though I would put it further down the list myself. I am very surprised to see Ola Dubh at only number 12 and my favourites are not even listed. Just goes to show that as a nation, most Irish people prefer the blander types of beer. No matter people's choices, there were no bad beers on the night and it was great to see people who are fans of good beer, and maybe even those who were introduced to good beer for the first time.